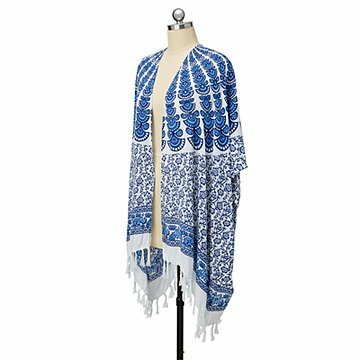 This lightweight wrap is beautifully adorned with a lush, indigo mandala print. The perfect frock for in-between weather, this lightweight kimono is beautifully adorned with a lush, indigo mandala print. Mandala is a Sanskrit phrase that means "circle" and represents the universe as both the vast reaches of space and our psyche. Inspired by the mandala's meaning, Indonesian artisans apply a scalloped interpretation to the topmost part of this design. A delicate briar patch makes up the mid-sections of the wrap, and the fringed edges dance with a parade of elephants and deer surrounded by blooming lotuses. One size fits most. Made of 100% rayon in Indonesia. It looks better in person. It feels so soft! This is perfect for those warm summer days that move into cool fall nights. It can wrap around you to keep you warm or open up to let the breeze flow! Love this! Not you typical Indian pattern. Really pretty. Lots of compliments. I got this as a Christmas gift for a friend. I liked it myself, and since we share the same taste in clothing I knew she would love it. I was right. She absolutely loved it. I have even thought about getting one for myself. You can wear this anytime. It fits all seasons. This gift caused problems as my other daughters wanted one! This is a beautiful top that can be used for nearly everything - dressed up for work, or with blue jeans for casual wear. I would classify this more as a coverup than a kimono, but whatever you call it it's undeniably lovely!! Perfect to add flair to an outfit anytime, whether you're going to work, a nice event or just want to dress up a bit. It is on the lightweight side so more suited to warmer spring/summer weather. The material is a nice quality and the pattern is gorgeous. I am excited to give this item as a gift!! Was disappointed after opening. It came in a clear plastic bag as if I purchased it from a drug store. No paper labels or card included with the item. I will take it out of the plastic bag, but no label to go with it, so I made my own informational label using picture and description from the website because it was going to be a gift. I didn't want them to think I got it at thrift shop. I have never been that interested in wearing kimonos and always admired them from afar. I saw this one and knew I would love it. The colors and patterns are amazing, and I love the fringe. It's so comfortable and soft, and I love wearing it on hot days. Easy to throw on over a tank top or long sleeve. I have received a lot of compliments on this kimono!